The Excel G3 Hyperlite Self Propelled Wheelchair is a lightweight self propelled wheelchair, it comes complete with a tension adjustable back to allow you to customise the back rest to suit you, it is also fitted with a half folding back as standard. 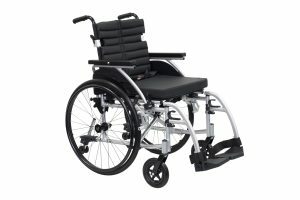 The Excel G3 Hyperlite has a padded back on the seat for added comfort, it also has height adjustable footrests that can also be removed for transportation, The G3 Hyperlite Wheelchair has quick release rear wheels to enable you to make the wheelchair lighter when putting into a vehicle. The Hyperlite Wheelchair has also be fully crash tested, so a user can travel in the chair when using transport. Call us on 0330 383 9988 to get free delivery on this wheelchair.